Road lighting with a difference! 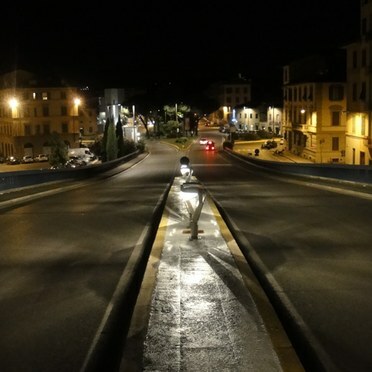 That’s the Orus installation along the Cavalcavia dell'Affrico rail track flyover in north-east Florence, Italy near the Campo di Marte train station. With a mounted height under the line of sight of most vehicles, plus a bi-directional optic housing a low wattage metal halide lamp, the advantages are obvious. No columns are required, running and maintenance costs are greatly reduced and motorist safety enhanced. Ten Orus luminaries are installed on either side of the two lane highway at 1m spacings, mounted on Y shaped stirrups at a height of 0.9m.